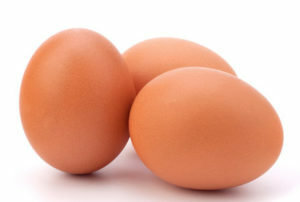 Place eggs in a single layer in pot and cover with cold water. add baking soda. Over medium heat, slowly bring to a boil. Once water starts to boil, cover and remove from heat. Let sit for 12 minutes. Transfer eggs to a bowl filled halfway with ice and water, this will stop them from cooking any longer. Let cool for at least 5 minutes. Peel and scoop out egg yolk. Can be eaten right away, or store in the fridge in an airtight container for up to one week.